NGC 6888 is located approximately 4,700 light years from Earth and is known as the Crescent Nebula because of its distinctive shape. Technically it is classified as a Wolf-Rayet nebula. Such a nebula is formed when a very hot, massive star ejects its outer layers in a strong stellar wind. 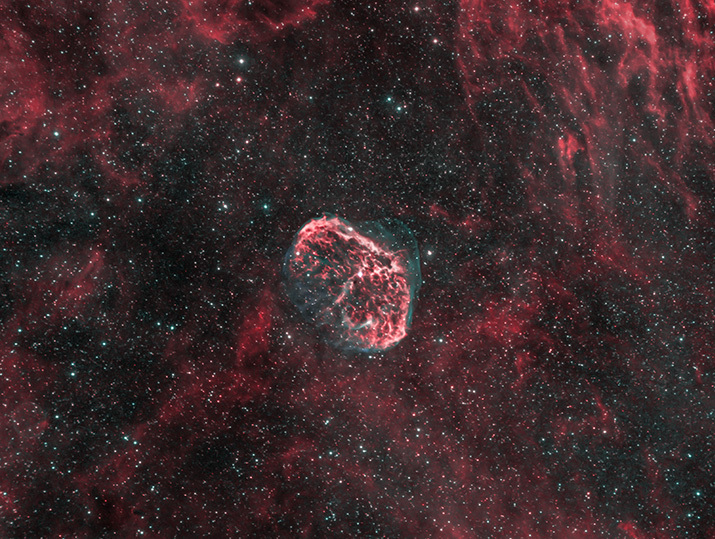 In the case of the Crescent Nebula the star responsible (WR 136) is the bright star in the center of the image above. As the star ages it begins to shrink and grow much hotter. Its stellar wind becomes more rarefied but much faster. This fast stellar wind then collides with the older ejected gas and pushes it into a relative dense bubble. WR 136 is in the final stages of its stellar life and is estimated to explode in a supernova event within the next million years. The image above was captured using Ha and OIII filters. The image was assembled by mapping Ha to red, OIII to blue and green, and RGB to the stars. A full narrowband Hubble Palette version of the image may be viewed here.